Sweeps & Prizes is Giving Away $50,000! 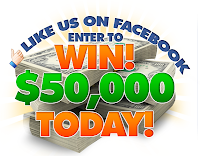 "Like" Sweeps & Prizes on Facebook to enter to win $50,000! You'll also get 5 chances a day to win great prizes in their Instant Win game! Click here and then the "Click to get started" button, then allow the app to enter!